Completely re-renovated on the outside, these roomy condos are in one of the best locations in all of Breckenridge. Situated in the south side of Breckenridge, Base 9 Condos are a quick five minute walk to the Quicksilver Chairlift located on Peak 9. There is also a great free shuttle that will you pick up right at the condos; it will not only take you to your favorite peak, but also anywhere throughout Breckenridge! The distinct design of this beautiful condo truly fits the image of a bustling mountain town. With the perfect combination of rustic mountain furniture and modern decorating styles, Base 9 truly is a rare find. 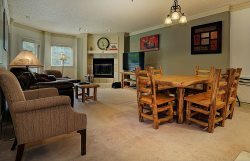 The main level of the condo has an open floor plan, vaulted ceilings, and lots of natural light. You'll enjoy the full kitchen with granite countertops, ample counter space, nice appliances, and a breakfast bar. The kitchen also houses an in-unit private washer and dryer. Upstairs you'll find a large and brightly lit master bedroom that overlooks the family room. A large window covering allows you privacy on this level. With a second TV, you can escape and enjoy some time alone. The master has an open archway entrance, but does feel rather private with the hallway separating the space from the stairs. You will also find a full bathroom on both of the levels. We love that the Base 9 Condos are in such a great location, and we like to offer a more competitive price than other ski-in/ski-out condos. Don’t hesitate to give us a call in order to get more information on these great condos! Parking lot space for one vehicle in the outdoor lot. Working with the team was an easy and seamless process. It really was pretty effortless. The property was perfect for us! We enjoyed it so much that we were planning on trying to rent it again next year at the same time. The location is perfect, the hot tub was great, and we had plenty of room for everyone. We were very happy with the whole experience! Five minute, enjoyable walk to the lift (quickest route is down Columbine, right at the Marriott, and along the walk way next to the pond). Five minute walk to shops and restaurants downtown. One minute walk to a convenient store with basic items (including beer, bread, eggs, and coffee). Bus stop adjacent to the parking lot (get familiar with the bus system; very convenient). Kitchen has what you need to cook for a group. Outdoor hot tub is ten steps from the back entrance to the unit. Neighbors are friendly. Bring one outgoing couple to stay in the upstairs master bedroom with no door. Call dibs on the downstairs bedroom with its own bathroom. Rental company is great. Cheers. This is a place everyone should visit in their lifetime. The facilities and shopping are AWESOME !!! My family just got back and we are all ready to pack up and head back. One of the BEST vacation places we have ever visited.